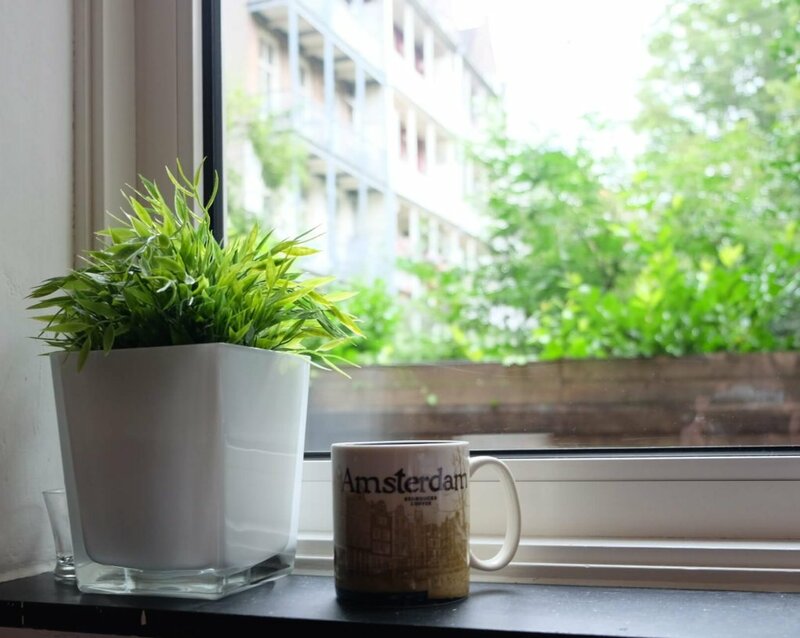 While we stay in Amsterdam for a few weeks, we are living in a 300 square foot apartment. Since we’re a family of 4, it’s a pretty cozy space, but we’re managing to make it work. We’re using what we know about simple living and small space living to be content in a smaller house. This has definitely been a challenge, and the closest we’ve been to living in a ‘tiny house’. I would say that the living space in the daytime is no problem at all. The kids and I have been fine in this space, and we try to get out to see the city as much as possible anyway. When we are home there is plenty of space for playing and meal preparation. Sleeping arrangements have also worked out pretty well, and the kids are small enough that mattresses on the floor haven’t bothered them one bit. The hardest part is the actual timing of bedtime for the kids. Since they are still only 3 and 4 years old, their bedtime is earlier than ours and it leaves some time before my husband and I usually go to bed. My kids are heavy sleepers so we can watch a movie quietly once they’re asleep, or we can bring chairs outside to the patio to sit outside, read, talk, and enjoy the evening. Here are some strategies I’ve used to make the small space living comfortable for us. I’ve had to be more intentional about it because of the tiny house, but these could be applied to any space to make it work more efficiently. The first thing I did when we came in was find simple ways to make the space work. We cleared the space as much as possible. This isn’t my own house so obviously I can’t actually get rid of things, but I could find a place for them out of the way to create more space! Clear out things that you don’t need to make space for your everyday living. Anything big that we won’t use went in the closet (to be put back in its place before we leave). I moved aside two end tables, two chairs, some unneeded blankets and pillows, and then we moved the loveseat to the side of the room to make a play-space for my kids. Quickly de-cluttering what we could helped make the space work and really opened it up! 2. A place for everything. There are hooks on the back of the door where we put coats as soon as we enter the house. Shoes get lined up in the small hallway by the front door. Backpacks have a place in this same hallway. Most clothes and things that aren’t being used get put back in the backpacks until needed. There is a small table in the kitchen were the kids play lots of games and make crafts. They each have a space on the window ledge to keep a pile of books, stickers, crafts, and toys. This gives them their own space to put toys; nothing gets lost and they know where to find activities. We use blow up mattresses for the kids at night. These get packed up in the day, and the girls slide their blankets under the loveseat. I thought I was content to pack light, but once we arrived here, it turns out I was really happy that we only packed in backpacks! There isn’t much space to put things here, so reducing the amount of luggage we have helped control the chaos. We are essentially just living out of our backpacks. We each have 5 outfits in total, and the small washing machine helps me keep on top of laundry very easily. I hang everything to dry, and then once it’s dried and folded it goes straight back into the backpacks. We didn’t bring much stuff with us, so we don’t have our things spread out everywhere, and the backpacks can stay in the small hallway next to the bathroom. 4. Limit what comes in the house. Buying small amounts of groceries at a time helps to save space in a small kitchen and fridge. It also helps reduce food waste since we try to use up everything, and then we make a meal plan before buying more. Being aware of buying habits also makes it easier to stay on budget and see how quickly we go through food. In terms of ‘stuff’ the only purchase so far has been a SIM card for my phone for maps and staying in touch with my husband when he’s at work. A smaller space and less stuff – we still have all we need!